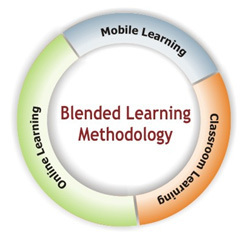 Blended Learning - What Is It? - 21centuryed Tech: Digital Teacher... Welcome To The Future! What is Blended Learning and what does it Mean to Students? Our district has taken a big step toward the future of education. Its investment in the 1 to 1 program is a step toward providing students the education and skills to compete in an amazing new world. With this in mind our classrooms are no longer within the school, but also in the community and world. As this happens happens students must acquire new skills to to be successful as they make steps toward being college and career ready. With this comes the idea of online learning and the combination of classroom and blended learning often referred to as blended learning. There has been a lot of discussion in education circles as to what blended learning really means. Most of us have come to realize that it probably involves the classroom and technology. In fact, the 1 to 1 programs across the nation emphasize the technology as an important component of classroom instruction. Yet, is this really Blended Learning? The answer is... maybe! A closer look needs to be taken in order to see how the technology is being used. The blended learning experience allows technology and the online experience to breakdown the traditional classroom allowing important transformation. One might wonder where on the spectrum of simple integration to blending learning a possible learning activity might be. Investigate through this this lens, ten ideas that educators and parents may wish to look at as student begin to use more technology both in school and at home. Sometimes it is just a simple tweak to bring out the wonderful possibilities of blended learning. As we continue to explore 1 to 1 learning experiences , it is important that we understand the blurred line between simple technology integration and blended learning. The assignments using all the tools in an LMS along with various web tools are key to using both in and out of school. Programs such as Flex Days and Snow/Inclement Day Make Up (Visit Snow Day Page) will also help blend the learning experience allowing for both learning of content standards and also important skill acquisition. Perhaps the video below will help develop an even deeper understanding. While simple technology integration is a wonderful step, it is important to reflect and refine practice and allow our classrooms and homes to provide opportunities for real authentic blended learning experiences. Perhaps the video below will help develop an even deeper understanding.